The dentist office can be a nerve-wracking place for many patients. An excellent dental hygienist can alleviate some of the nail-biting elements with a good bedside manner and a friendly smile. Under the supervision of a licensed dentist, dental hygienists perform basic dental care, focusing on a patient's’ teeth and gums and provide helpful basic tips to achieving good oral hygiene. Dental hygienists clean teeth, examine patients for signs of oral diseases and provide other preventative dental care. They educate patients on ways to improve and maintain good oral hygiene, teaching them the ins and outs of proper dental care. On a typical day, the dental hygienist works closely with the dentist on staff. The hygienist is responsible for a variety of tasks that include performing dental cleanings, taking and developing dental x-rays, filing patient records to track care and treatment, preparing diagnostic tests as requested by the dentist and applying sealants or fluoride. Dental hygienists must show compassion and interpersonal skills when working with people on a daily basis. Personal and professional growth will come from the relationships made between the dental staff and their patients. Dental hygienists must also be detail-oriented and maintain the physical stamina needed to treat patients all day long. To become a dental hygienist, you must have earned your high school diploma or its equivalent. You must also attend and graduate from an accredited dental hygiene school with an associate’s degree. A dental hygienist program will cover areas like anatomy, physiology, nutrition, radiography and periodontology. After graduation from an accredited program, dental hygienists must gain licensure in the state in which they are practicing. Passing the exam given by the American Dental Association Joint Commission on National Dental Examinations will provide you with the proper license needed to practice as a dental hygienist and is accepted by most states. A career as a dental hygienist offers a level of flexibility as there are full-time and part-time positions available. Depending on your personal and professional wants and needs, you can decide what option best fits your schedule. Hygienists also have options when choosing an office setting as dental hygienists can find opportunities in private dental practices, educational or community institutions, research teams and dental corporations. Working directly with the dentist, dental assistants complete a variety of tasks aimed to increase efficiency in the day-to-day tasks of a dental practice. Dental assistants perform comprehensive procedures and administrative tasks as needed. A successful dental assistant has excellent communication and interpersonal skills along with technical knowledge and a great eye for detail. Whether performing tasks requested by the dentist or assisting with a patient, a dental assistant is considered a quality dental professional and an invaluable member of a dental staff. Dental assistants have many tasks, ranging from patient care and taking x-rays to record keeping and scheduling appointments. Their duties can vary by state and by the dentists’ offices where they work. Find a local dental assistant program. There are several paths to become a dental assistant. Some states require dental assistants to graduate from an accredited program and pass a state exam. Most programs take one year to complete, are offered by community colleges, and lead to a certificate or diploma. Accredited programs include classroom and laboratory work where students will learn about teeth, gums, jaws, and other areas that dentists work on. These programs include supervised, practical experience. In other states, there are no formal educational requirements. Dental assistants who do not have formal education may learn their duties through on-the-job training. In the office, a dental assistant or dentist teaches the new assistant, dental terminology, the names of the instruments, how to complete daily tasks, how to interact with patients, and other activities necessary to help keep the dental office running smoothly. Some states require dental assistants to be certified. To obtain certification, dental assistants must pass the Certified Dental Assistant (CDA) exam from the Dental Assisting National Board (DANB). To take the exam, a dental assistant must graduate from an accredited program or have a high school diploma, and complete the required amount of on-the-job training. Applicants must also have current certification in CPR. Typical duties include preparing patients for oral exams, assisting dentists and hygienists with treatment, organizing and maintaining lab equipment, scheduling patients and developing radiographs. Dental assistants must be service oriented and reliable. They should possess strong communication and organizational skills. As a dental lab technician, most of your day will be spent in a lab where you’ll prepare patients’ appliances. You can choose to specialize in orthodontic appliances, crowns and bridges, complete or partial dentures, implants, or ceramics. The job of a dental lab technician isn’t as patient facing as a hygienist or assistant. The minimal interaction you’ll have with people is based on fitting them for devices and repairing said devices. You will, however, work closely with the dentist as you make sure of proper form and fit. Get a certificate through a trade school or dental school, or receive an associate degree through community college. Make sure your program is accredited through the National Board of Certification in Dental Laboratory Technology. Find a job at a dental office. Get trained further. In some instances, you can actually start your career from this point. The length of your training will vary by dental office and responsibilities. Certification for dental lab technicians is strictly voluntary. However, many employers do prefer their technicians to be certified. You can choose additional specialty certifications as well. One major benefit to certification is that it allows you to advance to supervisory positions. Find a local dental lab technician school. 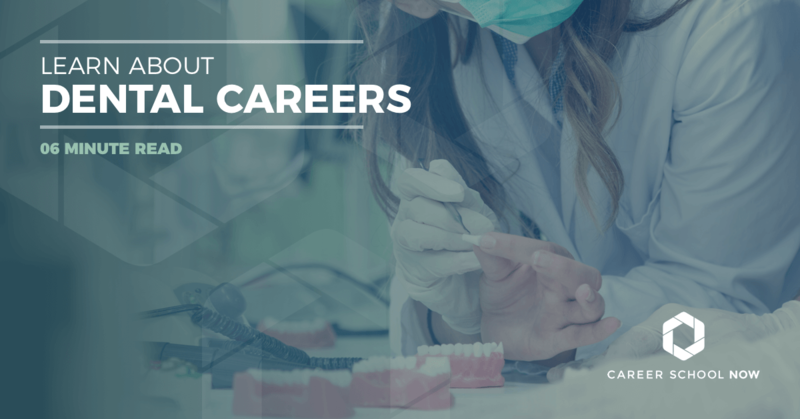 Dental lab technician careers are expected to grow by 13 percent through 2026, which is about 5,500 job openings. This is much faster than most other occupations. Veneers, dentures, and other cosmetic prosthesis are lowering in cost, so the demand for them is becoming greater, contributing to the rise in employment. The median annual salary is more than $36K, with the top 10 percent of the profession earning just under $60K. Some determining factors in your salary is where you work, where you live, and how much experience you have. If you dream of a career in dental but are too busy for traditional brick-and-mortar classes, online courses may be a good fit. Several schools that offer dental programs partially online. For basic and major classes, online is fine. However, students must gain some hands-on clinical experience through on-campus labs. Some schools may also require students to complete clinical practice requirements at a dental office, supervised by a certified professional. Students should look for programs that are accredited by the Commission on Dental Accreditation and should always check with their state’s boards to see if a program meets requirements. Licensing and certification requirements vary by state. Graduates of dental hygiene programs must pass an exam by the American Dental Association’s Commission on Dental Accreditation to gain national licensure. What does a dental lab tech do?